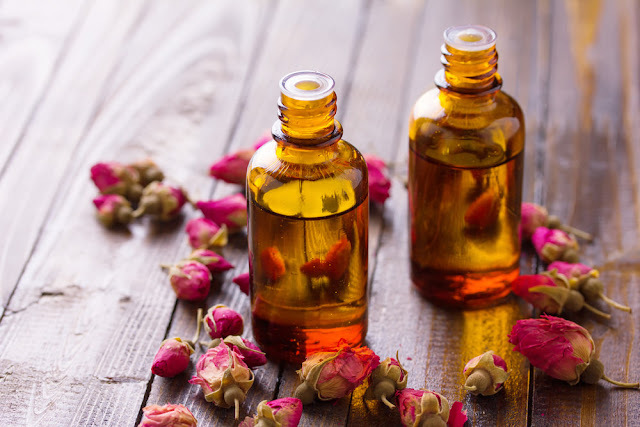 Aromatherapy is good for everyone and can be used in a variety of ways. Whether you are using essential oils in your bath water, or body lotion, in a manicure or pedicure. Lavender – is a relaxant, it adds balance and boost the immunity. Lavender is great for manicure and pedicure. Adding two to three drops in to your water and letting the hands a feet soak. Chamomile - like Lavender is great for relaxation. Chamomile sooths nerves and is also helpful with menstral cramps. Chamomile is most effective when use in pot Pori or candle or Chamomile tea. Peppermint – The strong minty sent of Peppermint helps with sinuses, energy and acts as a stimulant. When using Essential oils, ensure that you are not placing the oil directly to your skin. Direct contact with the skin can cause irritation and become very uncomfortable. When mixing oils, you will need to have a non-scented lotion base. Have a container you can mix the lotion and oil in. Since Essential Oils are strong in scent you only need to add two to three drops and stir well into the lotion. Depending on the amount of lotion you have for mixing you may need more or less. Judge carefully. It is a good idea to test a small area before applying oils to the hand, feet and body. Supplies needed: lotion, essential oil of choice, cotton balls, nail polish remover, nail file, plastic wrap, hand towels, cuticle oil, base coat, top coat, nail polish of your choice. Before you begin warm-lotion of your choice in a microwavable container; when heated add essential oil of your choice into the lotion and stir well. Cover the lotion with a towel and let cool. Tear two pieces of plastic wrap enough to wrap your hands. Assistance may be needed for steps six and seven. Push back cuticles and clean under the nail bed. File nails into desired shape. Apply cuticle oil and massage into cuticles. Wrap hands in plastic wrap, then with the hand towels. Sit for approximately five minutes. Remove towels and plastic wrap and massage the rest of lotion into hands. Use a cotton ball and clean the nail bed. Apply base coat and polish of choice. Finish with a top coat and let dry.